Today, we are doing a lunch-time perch fry at work . I made pumpkin cookies with chocolate chips. Recipe is coming…I still have half a pumpkin in my fridge! There are some perks of living in the North Country…like random Friday Frying at lunch. Yum. Is it sad that this is the highlight of my week? I don’t feel bad. I’m obsessively reading The Girl with the Dragon Tattoo series. I started The Girl Who Played with Fire last night and I have a feeling I won’t be sleeping much until I finish it..probably sometime in the next two days. I am also obsessed with the library. Movies, books, cookbooks. My inner nerd is so happy these days. Yesterday, I borrowed Citizen Kane and requested a few books that I have been dying to read. I also took out a book on Jewish Food for Farmer Ben. He loves it. I love him. It’s perfect. My last post highlighted a serious food event. I melted a giant chunk of dark chocolate in a double-boiler. Then I dipped pretzels, placed them on a cookie sheet lined with wax paper and stuck them in the freezer. Such a quick and easy snack to satisfy your sweet and salty craving. Farmer Ben had gotten to the pretzels during the day, so I’ll have to make more this weekend. Le Sigh. Thankfully, I have a ridiculous brick of chocolate that is dying to be used. But I love it. I get to mess up the kitchen, chat with the hubs and daydream about all the delicious things we’ll be eating throughout the week. We typically soak some kind of bean, cook off some rice, pasta or quinoa, make a batch of tortilla dough to hang out in the fridge until we are ready to whip up some breakfast burritos or wraps, chop up some veggies, boil some potatoes for breakfast and cook some kind of meat or lentils. I even make granola or bread when the mood strikes! It’s almost therapeutic. Until I have to do the dishes. Also… Farmer Ben and I have Serrano Cream Cheese. Delicious. And Brilliant. Especially on breakfast burritos. I’ve also rediscovered my love of all things pickled… like pickled asparagus. 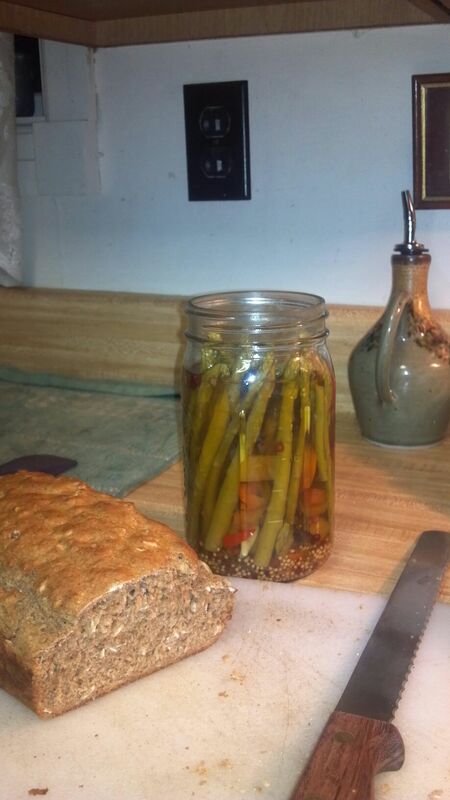 Pickled Asparagus and beer bread. Dinner. Running has been rough. It’s been cold. Really cold. I feel shin splints coming on. I hate shin splints…I am not sure what to do. On one hand, I need to keep running. I need to get those miles in. On the other, I don’t want shin splints or other weird aches and pains I’ve been having. A surprisingly warm night. You can’t tell but I am actually wearing 37 layers. My body hasn’t been very happy with me lately, which further frustrates me. I’m playing around with my food intake to see if I can figure it out. On a happier night, the hubby and I, after a bit of a hiatus, moved onto Level 2 of the Shred. It’s hard, but in a good way! I desperately need new running shoes. But I’m broke. I think it’s time to get a part-time gig…as much as I don’t want to. I recently discovered Pinch of Yum. Great site with some great recipes. Check it out! I also discovered Dinner with Julie. Ditto. This is probably going to offend some people, but I want to put it out there. You are NOT going to hell if you eat meat on a Friday. Sorry to disappoint you. If you need further clarification, open up your Bible and read Mark 7:15-23. If you still feel that you need to deny yourself, that’s fine, too. To each their own. Speaking of the Bible, 1 Corinthians 9:24-27 has been all over my brain lately. I think it has something to do with the fact that I am training. Regardless, this passage has kept me pushing through a lot of tough situations lately. Race planning has officially taken over (most of) my life. Speaking of which, if you’d like to enter Strides for James, click here. Not only do you get a sweet t-shirt, you also get entered into a drawing for some amazing prizes. Do it! The amount of sponsors we are racking up is crazy. I am just overwhelmed. This is a lot of hard work, but I am so looking forward to the outcome. Seriously. We are not only going to reach our goal, but we will surpass it. I think that’s all for now. Life is moving really fast. With the promotion, a new office, chair, carpet, replacement, and a raise…and a whole mess of craziness! More free time..which I am so not used to! Some major fundraising for a great cause. If you’ve been following my blog for a little while, you know that in June of 2012, I lost a co-worker and friend. It was all of a sudden and it was really hard. Our whole office felt it. But, we decided to do something to help James live on. We started a scholarship endowment fund for James and have been working hard to reach our initial goal of $10,000. Since we began in July of 2012, we have raised about $7,500. It’s been a lot of hard work and I am so happy to be a small part of this wonderful group. It’s amazing that this group (including co-workers, the family and community members) took such a painful loss and have turned it into a major positive. In all honesty, I am in disbelief that we have raised so much so quickly. What an amazing group. And how amazing is our community’s generosity?! I’m speechless. It’s been so uplifting to see people come together, especially under such tragic circumstances. James would have been 27 on February 12. I realized this a few days ago and it really hit me. He had so much life ahead of him. I’ve been working with his sisters on planning this fun run and one of them sent me photos to use on race material. One was taken not long before he passed and seeing it was, for lack of a better word, heart-wrenching. I’ve dealt with his death. I know that he is in a better place. But the last month–especially the last two weeks–have been really difficult. Looking at old photos, sharing stories about him, meeting and emailing his sisters… It’s comforting, but it also brings back that day in June. And it all comes back. My heart still breaks for his family. He was such a caring, warm person… Thinking about that, well…it explains why we are already so close to our goal. Because the people who knew him, knew that. And they want to share that warmth and caring with people for years to come. I know I do. So, we’ll continuing working toward our goal–and past it! And we’ll continue to celebrate the life that touched us, if only for a short time. I know it’s early…but happy birthday, James. You left us too soon but I know that you’re in a better place.